This origami model is a Traditional design. For this finger puppet, it would be nice to use paper that has a white side and a colored side, but if not, your puppet will still work fine! The paper needs to be square, so ensure you have the right type of paper on hand. 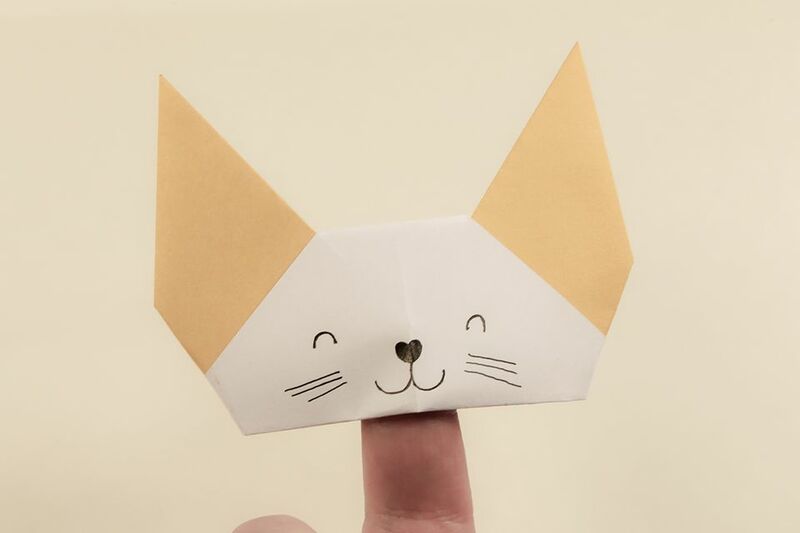 This origami puppet looks like a cute cat, but you can make other animal faces too, such as a bat or dog, by drawing a different face, or folding the ears differently. For a fun craft activity for kids, you can decorate these with glitter, sequins, and ribbons! 1. Fold in half vertically. 3. Fold in half horizontally. 5. Fold the right corner down to the bottom center point. 6. Fold the left corner down to the bottom center point. 7. Fold the right flap up from the center as shown. 8. Roughly position the flap with the right edge at a ​90-degree angle. 9. Fold the left flap in the same way as the right. 10 & 11. Fold one layer from the bottom section up to the top point. 13. Fold the left and right edges inwards as shown in #14 & 15. 16. Fold the bottom section up to the top point. 17 - 19. Fold the top section down, including all layers. You could stick these down if you like. 20. Turn the model over. 21 & 22. Draw a cute face! Your cute little finger puppet it finished! Don't worry if it didn't work out the first time, just try again, it can take practice.